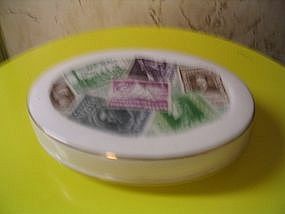 Porcelain box with sponge for dampening stamps. No maker's mark. Measures 4 3/4 x 3 3/4 inches. No damage, but one tiny stray paint smear on top. The sponge is present but has hardened. I need your zip code to calculate the postage.